LeEco, formerly known as Letv, is finally coming to the U.S. The company’s big event kicked off in San Francisco on October 19. The company announced two smartphones, some TVs, a streaming service, and outlined plans for its electric autonomous car and a smart bike. We have all the news for you here in this roundup. If you haven’t heard of the company, you’re not alone, and no, it’s not a French company, despite the “le” in front of its name. LeEco is a Chinese firm that has been around since 2004 under the name Letv, and it’s one of the largest online video companies in China. Its nickname is “Netflix of China.” Not too long ago, LeEco began selling smartphones to push content, and these aren’t your average budget devices. The Letv Max Pro was the first smartphone with Qualcomm’s Snapdragon 820 processor. Now that the show is done, here are all the devices LeEco announced today. Stay tuned for hands-on coverage on Digital Trends. LeEco’s first big smartphone to hit the U.S. will be the LePro3, a high-end flagship killer with the same spec sheet as the Google Pixel XL, minus the high price tag. The phone is powered by Qualcomm’s Snapdragon 821 processor and 4GB of RAM just like the Pixel XL. It has a 5.5-inch Full HD screen with a resolution of 1,920 x 1,080 pixels packaged in an aluminum unibody design. There’s a fingerprint sensor on the back for security and mobile payments. Like the iPhone 7, it axed the headphone jack in favor of what LeEco calls “Continual Digital Lossless Audio” tech through the USB-C charging port. Theoretically, your audio will sound better, but your old 3.5mm compatible headphones won’t work without the included adapter. A 4,070mAh battery powers the phone and you can juice it up in a jiffy with Quick Charge 3.0. The phone boasts a 16-megapixel rear camera and an 8-megapixel selfie snapper, which should produce good photos. You can capture 4K video and slow-motion, too. LeEco offers 64GB of storage on the LePro3 and there’s no MicroSD card slot for expansion. It’s also running Android 6.0 Marshmallow, which has since been surpassed by Android 7 Nougat. It’s unknown how quickly the software will be updated. You’ll be able to snag a Lepro3 for $400 in the U.S. on November 2, and LeEco offers a $100 rebate to bring the price down to a mere $300. That’s very cheap for a phone with these specs, especially when you consider the Pixel XL’s starting price of $770. To sweeten the deal even further, LeEco is throwing its EcoPass service for free. That means you get offers unlimited photo and video storage, 5TB of cloud storage, an extended warranty, and news about LeEco’s sales. The LePro 3 comes in gold and silver and you can check out all the details at LeMall, LeEco’s online store. The mid-range LeEco S3 features an “ultra light” metal body and a 5.5-inch Full HD, 1,920 x 1,080-pixel screen shielded by Gorilla Glass. Under the hood, it sports Qualcomm’s Snapdragon 652 processor and 3GB RAM. The Le S3 also boasts a bevy of other differentiating features, too, including a 16-megapixel rear camera that’s capable of capturing 4K and slow-motion video. Rounding out that hardware is an 8-megapixel front-facing camera, a fingerprint sensor, a 3,000mAh battery, and a loudspeaker with Dolby audio optimizations. The Le S3 has 32GB of internal storage and no MicroSD card slot for expansion. It’s also running Android 6.0 Marshmallow, which has since been surpassed by Android 7 Nougat. It’s unknown how quickly the software will be updated. Like the iPhone 7, the LeEco S3 doesn’t have a headphone jack, so high-quality audio travels to your ears via the USB-C charging port. Your old 3.5mm compatible headphones won’t work without the included adapter. You’ll be able to snag a LeEco S3 for $250 in the U.S. on November 2, and LeEco offers a $100 rebate to bring the price down to a mere $300. That’s very cheap for a phone with these specs. To sweeten the deal even further, LeEco is throwing its EcoPass service for free. That means you get offers unlimited photo and video storage, 5TB of cloud storage, an extended warranty, and news about LeEco’s sales. The LeEco S3 comes in gold, rose gold, and silver and you can check out all the details at LeMall, LeEco’s online store. Each of the new TVs is pre-loaded with familiar apps like Netflix, Hulu, YouTube, Sling TV, and others, but LeEco wants to draw customers into its own ecosystem. The company announced several launch partners today — some of whom, like Lionsgate and Vice — had presenters at the show, along with others like Sling TV, SeeSo, and Showtime. These companies will provide video content via a number of built-in apps, like Live, which LeEco says offers nine streaming channels at any given time, offering a channel surfing analog. Le, on the other hand, is an on-demand service loaded with content from LeEco’s partners. Another app, Le View, attempts to learn your tastes as you watch content. Finally, the company unveiled EcoPass, a service somewhat similar to Amazon Prime, which buyers of a LeEco uMax 85 TV get free for one year, along with a three-year warranty. The service offers unlimited photo and video storage as well 5TB of online storage for whatever users want, as well as discounts on the company’s LeMall store and unlimited monthly viewing of Fandor — an online independent film streaming service. LeEco showed off four TVs. The star of the show is the company’s latest flagship, the 85-inch uMax85. As expected in such a sizeable TV these days, the uMax85 supports 4K resolution, but it doesn’t stop there. The TV also features support for both HDR standards: HDR10 and Dolby Vision. So far, the only other companies offering TVs that support both are LG and — surprise, surprise — Vizio. It uses a vast array of local dimming zones to make for darker blacks and thus better contrast, as well as more uniform brightness. In the case of the uMax85, a total of 448 separate partitions. The TV also features Fluid Motion for sports fans and claims to provide one of the best TV experiences for gamers. The TV has 4GB RAM and 64 GB of internal storage, as well as Harman/Kardon speakers. The suggested retail price for the uMax85 will be $5,000, but a rebate program promises that amount drops to $4,000 at checkout. As such, this appears to be one of the least expensive TVs of its size and capabilities on the market. The company also announced its Super 4X UHD TVs would be coming to the U.S., though details were all but entirely absent. The TVs will be available in 43-inch, 55-inch, and 65-inch screen sizes, priced at $1400, $900, and $650 MSRP respectively. Rebates on these TVs will also be offered and, like the uMax85, LeEco promises best-in-class performance. For the time being, additional specs are not available. 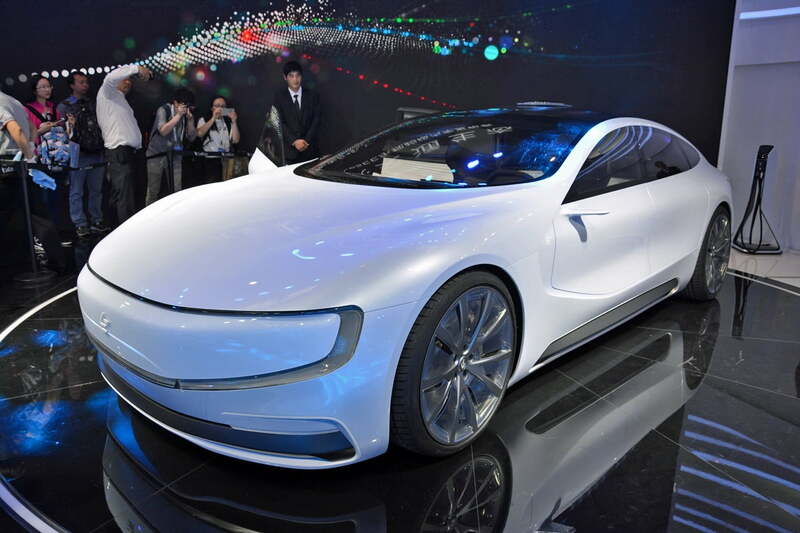 LeEco has automotive ambitions. Its concept car the LeSee is an eco-friendly, electric, autonomous car. The company hopes to end smog in China with its ambitious car project. The car was supposed to roll into the show, but it was delayed en route to the event. We don’t have many details about the car yet, since it’s a concept, but it sure looks cool.